Dit Line 6 StageScape M20d demomodel is een erg modern 20-Input Smart Mixing System van hoge kwaliteit, voor een betaalbare prijs. StageScape® M20d is the world’s first smart mixing system for live sound. Utilizing a groundbreaking touchscreen visual mixing environment, StageScape M20d streamlines the way you mix to get your sound dialed in quickly and stay in the creative zone. Massive DSP power delivers comprehensive, professional audio processing on every channel including multi-band feedback suppression. Pristine audio quality will impact your stage performances, and multi-channel recording allows you to easily capture every rehearsal or show, with or without a computer. 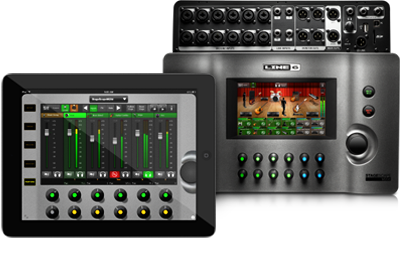 The entire system can be controlled remotely from the stage or audience with one or more iPad® devices. StageScape M20d is the integrated professional mixing system that delivers great live sound, so you can focus on what’s most important: your performance. StageScape M20d features an intuitive, 7” full-color resistive touchscreen interface to get you mixing fast. 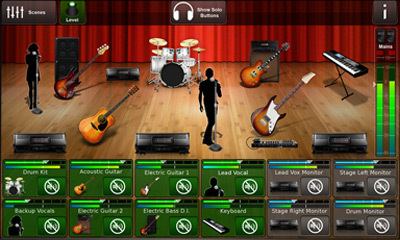 The touchscreen displays icons on a stage that represent each performer or input, replacing generic rows of knobs and faders. 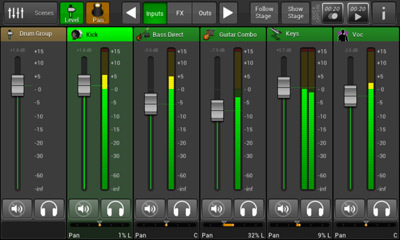 Now you can reach for elements in the mix as you see them on the stage in front of you. A single touch on a performer’s icon gives full access to all parameters relating to that channel, from basic tweaks through deep effects editing. For a more traditional mixing experience, you can instantly switch to Fader View and use virtual faders to mix inputs and groups, FX returns, main and monitor outputs, and more. Fader View also enables you to mix monitor sends on faders for those “Can I get more me in my monitor?” moments. 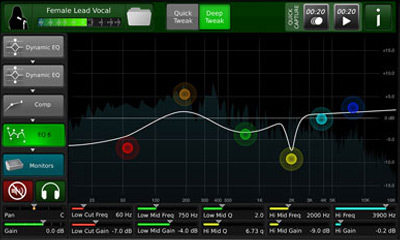 And when your singers want to hear reverb or delay on their vocals, you can send master effects to their monitors. Easy and intuitive, these features are typically only found on more expensive digital consoles. From solo performances to full band shows, setting up for gigs is fast and easy. With auto-sensing inputs throughout, StageScape M20d activates each microphone or line input as soon as you plug in a cable and automatically configures a custom channel strip setting that includes essential gain, EQ, effects and routing. The monitor and main outputs work the same way. 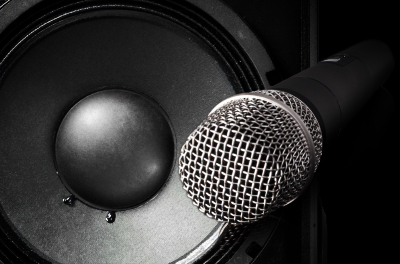 Plug in a PA speaker or monitor and it immediately appears on the touchscreen and output signals are automatically routed. The convenience of mobility has become integral to so many aspects of our lives, and the M20d extends that convenience to the stage. Connect one or more iPad®devices simultaneously (via a compatible USB WiFi adaptor) for complete remote control over all mixer functions. Adjust the front-of-house mix from anywhere in the audience. 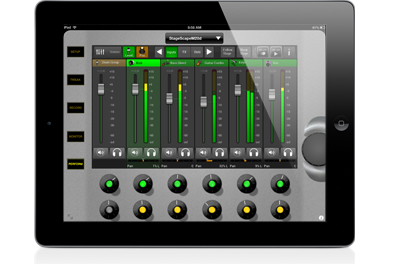 Each iPad® can control different screens or different parameters in addition to the mixer’s own touchscreen. Whether you’re a band member adjusting your monitor mix or a sound man out in the audience, you’ve got full control. StageScape M20d provides a professional suite of dedicated Dynamics, EQ and FX processors custom tailored to each channel including fully parametric EQs, dynamic EQs, filters, standard and multi-band compression, limiters, gates, delays and more. That’s over 100 professional audio processors ready at all times to create the perfect mix. 32-bit floating point processing throughout provides pristine, high-resolution sound quality. Everything you need to get professional instrument and vocal sounds is available where you need it, when you need it. StageScape M20d makes it easy to get a great-sounding live recording — in the way that works best for you. You can capture 16 channels plus the main mix in high-resolution, 24-bit WAV format to SD card, USB drive, or direct to your Mac® or PC. There’s no need to set up a DAW — simply mix the raw tracks in your favorite software later. From ideas and rehearsals to entire performances, StageScape M20d is the fast, streamlined way to get amazing live recordings. Since feedback can quickly ruin a performance, StageScape M20d features per-channel multi-band feedback suppression. The technology quickly identifies problem frequencies and compensates automatically. Feedback suppression works by continuously analyzing the audio signal, identifying frequencies that have the characteristics of feedback (steady frequencies with few overtones, rising in amplitude), and then applying a narrow notch filter to remove the offending frequency. You can control up to 12 independent feedback frequencies.